"I was humbled to be chosen for this recognition," says Stark. "While proud of my career, I'm only successful because a lot of people have either supported or guided me. In most of my successes in career and life, a lot of people rallied around to help me or that activity I was involved in be successful." Doug Stark wanted to return to his family's dairy farm near Riverton in 1980 after having in hand his bachelor's degree in agricultural business from the college. 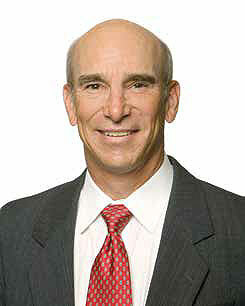 Instead, he joined Farm Credit Services of America (FCSAmerica) and would rise to its president and CEO in 2005. "I would have loved to have returned," says Stark, who is one of two recipients of this year's Outstanding Alumni Award. "At the time, it wasn't an option. Our operation was not big enough to allow me to come back into it." That might have happened in the greener pastures of today's agricultural landscape. Stark oversees a loan portfolio of more than $18.5 billion with 60,000 producers, says Associate Professor Roger Coupal in the Department of Agricultural and Applied Economics in his nomination letter. FCSAmerica serves Wyoming, Iowa, Nebraska, and South Dakota. Stark said earlier this year he believes more young people are wanting to come back to the farm or ranch than seen in a long time. "I think a little bit of it is a generational thing," says Stark, who became FCSAmerica regional vice president in 1986 supervising eight branch offices during that decade's farm crisis. "It was such a tough time for producers in that cycle," he notes. "Farmers were cautioning their children from getting into agriculture because it was so challenging. Now, ag is in a much better position. Ag is much more profitable and as a result young people see a future in it." Lessons from the '80s strengthened the industry. "Producers got to the point they pulled in their belts and gutted it out and as a result they learned some things – as did our company," Stark says. "Coming through that time made all of us better in our services. Farmers were more efficient. Lenders were more efficient. It was a challenging time period, but out of those challenges came the experiences and strength to be better and more effective." "I think we all have those turning points in our lives," he says. "I have a great quote one of my leadership coaches told me. 'When the student is ready, the teacher appears.' When the heart and mind is open for learning, whether in our careers or personal development, someone will show up in life to help fill the void and take you to another level. I've found that to be the case in my career. When looking for that opportunity, even if it was consciously or not, somebody would come into my life who helped take me to another level. That’s just the way it works." Stark has maintained ties with the college during his time at FCSAmerica. He co-teaches a leadership class with Dean Frank Galey for students, and last year invited the association's board of directors and executive leadership team to the university for their annual summer planning meeting. "The data and information FCSAmerica has graciously shared with faculty members over the years has been used to fund research including graduate student projects and extension work," notes Coupal. "Some of the extension work that was based on FCSAmerica input is still in demand by banks, agencies, and producers. Some of the research work has produced still highly cited journal articles." "I reflect on my career at UW and the incredible opportunity (higher education) has to shape young lives," he notes about his collaborations with the college. "I wished I had more insight into leadership earlier in my career than I did. My hope is to provide some experiences I have had over my career and give the students (knowledge) that took me years of experience to gain." "He frequently conveys his desire for each of us to not only be better team members but also better family members, friends, and citizens," team members stated. "It's a passion I have," he says. "One of the essences of being an effective leader is inspiring a shared vision. It's really about getting people to care. Leading is not about a title or position – it's about action and purpose that really can apply anywhere in any business and in any line or career line of business." That made an impression upon Peter Burgess, a graduate student in the Department of Agricultural and Applied Economics and who participated in Stark and Galey's leadership class. "He spoke passionately about integrity and its importance – not just professionally but in all of our spheres of influence," wrote Burgess. "He described a true leader as having the ability to model the way and encourage the heart." Leadership is about helping people and the organization maximize their potentials, Stark says. "Imagine what the world would be like if everybody performed at their maximum capability. I think that is exciting and intriguing."